Without a doubt, pro-charter school forces took a beating over the past year. There was a big setback in Georgia, and the Massachusetts vote on allowing charters to expand was nothing short of a money-losing, brutish beatdown. Things only worsened with the election of Donald Trump and his appointment of the wildly unpopular Betsy DeVos as education secretary. To charter supporters, especially in deep blue cities and states, their loving embrace of charters looked more like a kiss of death. But then came Los Angeles, where only a few weeks ago, two pro-charter school board candidates won unexpected victories, creating a charter-friendly board in the heart of deep, deep blue L.A. — a shocking development. So the curse has lifted? We can expect more charter school victories around the country? Wishful thinking on the part of charter advocates. 1. The “Trump-DeVos agenda” attack tactic. This is what the pro-charter forces feared most, and for good reason. Internal polling before the election showed this to be potent. Who in L.A. supports Trump? There’s a reason the president, to date, has not chosen to land Air Force One in California. 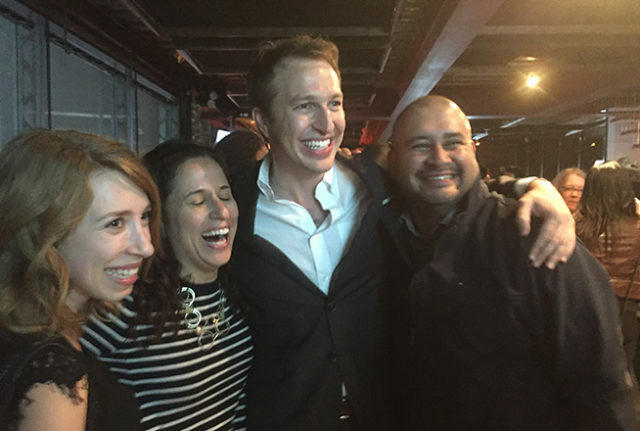 So if Trump and DeVos love charters, and school board challenger Nick Melvoin is pro-charter, then twinning the two should be easy, especially since he was challenging school board president/charter skeptic Steve Zimmer. The union spent millions on firming up that association in the minds of voter. Should have worked, but it didn’t. The problem for the union was that Melvoin has considerable Teflon on that tie-in. He’s a deep blue Democrat who worked in the Obama White House and was endorsed by both former Obama Education Secretary Arne Duncan and California Sen. Barbara Boxer, who is about as blue as anyone in the Senate. Maybe bluer. Bottom line: The Melvoin victory in California doesn’t mean the “Trump-DeVos agenda” tactic won’t work elsewhere against other candidates. It just didn’t work that well in L.A., where even lightly informed voters understood that people such as Boxer and Duncan wouldn’t endorse a Trump supporter. 2. The unions (inexplicably) never dropped the big political bomb most feared by pro-charter forces. That bomb, so skillfully deployed in Massachusetts, was a simple calculation of the dollars lost by traditional school districts as a result of students leaving for charters. There, the unions spent millions drilling this message into every voter: Charters DRAIN $400 million a year from districts! Then, to make sure that message got localized, the anti-charter forces broke it down district by district: This $ amount is EXACTLY how much charters are hurting your child’s school! For the moment, let’s step around the obvious question of whether school districts should get reimbursed for students they are not educating and point out that from a political perspective it was a highly effective message. Some towns without a single charter school — not even the prospect of one arriving in the future — overwhelmingly voted against the initiative. Just in case! So why didn’t the Los Angeles district and its unions break down the dollar loss per school and spend millions spreading that message, Massachusetts-style? Not clear, especially given the close involvement in the L.A. race by the national unions, the American Federation of Teachers and the National Education Association, whose top players knew exactly why they won big in Massachusetts. Bottom line: In other states, and other cities, it is highly unlikely that anti-charter forces will make that same mistake twice. 3. The “billionaires are out to privatize your school” tactic. Why didn’t it prevail? Unlike traditional schools, which are built with public dollars, charter startups must find their own facilities money. Thus has unfolded a key role for education philanthropists. Or, as the unions would phrase it: profit-seeking “billionaires” out to ruin public education. In L.A., at least, the “billionaires” tactic didn’t prove to be a winning strategy. But while pro-charter forces might like to believe that facts negated the tactic (there isn’t a single for-profit charter school in all of Los Angeles), the more likely explanation is that in L.A., being a billionaire isn’t necessarily seen as evil. Take billionaire Eli Broad, for example, a prime target for the union. Broad may have given millions to charter schools there, but he’s generally seen as a pretty nice guy, about to turn 84, who is giving away his fortune not just for schools, but for medical research and art museums as well. The newly opened Broad Museum in downtown L.A. is a favorite. And it has FREE ADMISSION. How evil can he be? Is there a single Angeleno who believes that Eli Broad has a hidden plot to make money off struggling urban schools? Other than union fanatics, doubtful. Then there’s billionaire Reed Hastings, co-founder of Netflix and another big charter supporter. Especially in movie star-oriented Los Angeles, who doesn’t like Netflix? Is there a single Angeleno who believes Reed Hastings hopes to profit by turning Los Angeles Unified into a Netflix movie offering? I doubt even the union leadership believes that. Bottom line: In other cities, especially where evil-sounding “hedge funders” (who prefer to remain unidentified but inevitably get “outed,” expose-style, in newspapers) are the big charter funders, the “billionaire” argument is far more likely to fly. 4. Money made all the difference. This was the priciest school board race in history, with the latest figures showing nearly $17 million spent. And the pro-charter side outspent pro-union groups 2 to 1, pouring at least $9.7 million into the race. There’s no question the money helped, especially in fighting back against the “Trump-DeVos agenda” association leveled against Melvoin. Saturating voters in sprawling Los Angeles with the message that Melvoin’s background is true-blue Democrat didn’t come cheap. But what I found interesting in the interviews with the pro-charter side was the downplaying of the money advantage. That may sound like poor-mouthing on their part, but consider Massachusetts, where the spending on behalf of charters was even more lopsided ($24.2 million to $14.5 million), according to The Boston Globe. The ballot initiative went down by a very lopsided 62-38; massive pro-charter spending definitely didn’t matter there. That vote definitely motivated the charter school base — mostly Hispanic parents who rely on those schools, to both work on the campaign and turn out to vote. Bottom line: Repeatedly, I was told the same thing by those in the campaign. What mattered most was having quality candidates and a motivated charter parents who vote. Where that same factor is at play in other cities, you can probably expect similar outcomes, regardless of the millions spent on TV advocacy ads. Absent that, the millions in TV buys will probably prove useless. 5. The Los Angeles Unified School District has legitimate problems; really big problems. By the district’s own math, it faces an unfunded liability of $13.6 billion for retiree health care benefits. The district is a rarity in generosity: Retirees — and their dependents — get lifetime medical coverage. And that’s only somewhat related to the district’s more immediate $1.6 billion projected deficit. Any voter paying close attention knows that the district hasn’t taken these deficits seriously for years. In a period when the district was losing 100,000 students (roughly half to charters), it was actually adding staffers. Plus, the best research shows that charters are doing a much better job educating the district’s many low-income students. So if you happen to be the board president overseeing all this, and you also happen to be closely tied to union President Caputo-Pearl, it’s not hard to imagine how a barrage of attack ads might carry a pretty potent message: What were they thinking? Bottom line: Elsewhere in the country, you’re not likely to find school districts this out of control, and therefore vulnerable to campaign messages about mismanagement. All this may sound dismal to school reformers. So we’re not over the Massachusetts setback? Actually, the final bottom line is more hopeful. As Petrilli points out, Massachusetts-style initiatives are tough. If voters can find a reason, any reason, to vote no, they will. Winning that was always a long shot. The good news: There are no more charter initiatives on the near-term calendar. In California, there are a governor’s race and a state schools superintendent race coming up, which are likely to echo the issues of the L.A. school board contest. What’s coming up nationally next year is a slew of governor/legislature races, many of them flavored by school reform issues, especially charter schools, which unions and school superintendents (correctly) see as the biggest threat. Is there hope emanating from L.A.? Probably, in one very big area: campaign financing from wealthy donors (aka “billionaire privatizers” in union verbiage). In my interviews, I was told repeatedly that those donors were getting weary of losing. Billionaires, after all, tend not to think of themselves as losers. Now, based on the L.A. victories, they have a reason to keep spending. And, as L.A. proved: Quality candidates, good funding, and a solid ground game can carry the day. In Massachusetts, the teachers unions owned the ground game. In Los Angeles, it appears just the opposite played out. Hustle counts. On the other side of the ledger, any competent pushback campaign will go full bore on the charters-draining-our-budgets strategy that proved so effective with middle-class progressives in Massachusetts. What’s the answer to that argument? An appeal to social justice and civil rights is probably the right path. Shouldn’t all students have access to good schools? But good luck making that work: It didn’t overcome the more persuasive “charters are draining us” argument that persuaded voters in well-off Massachusetts suburbs. No shortage of tough fights ahead. Richard Whitmire is the author of several education books, including The Founders: Inside the revolution to invent (and re-invent) America’s best charter schools.